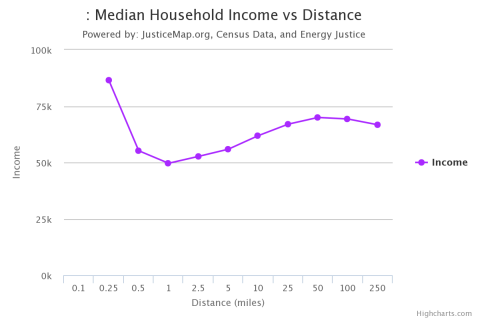 This test lets you examine whether the race and income of people who live near a set of points is different from those who live farther away. For instance, you might want to test if landfills are disproportionately located near lower-income households. To test your own data you must upload a CSV data file with a first row that includes the column titles. The accepted column titles are: 'ID', 'latitude', 'longitude', and 'weight'. You MUST use these names. What are you analyzing? Ex. landfill. You can either use our power plant data OR upload your own data file. Income: American Community Survey (2012-2016).